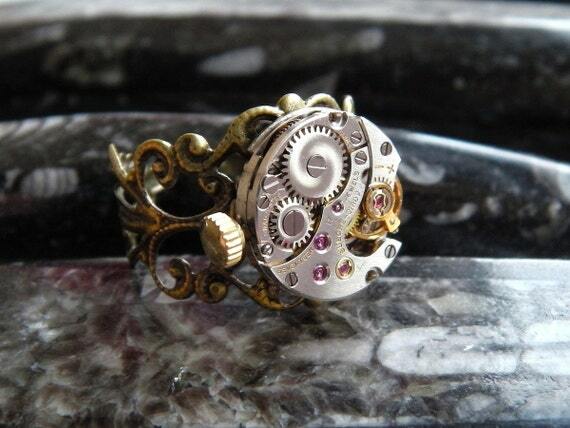 ☣ This decorative ring features a superb quality petite Bueche Girod 17 jewel Swiss watch movement. You can see several of the original ruby red jewels on the face of the mechanical watch. In the photos I have tried to capture the swirl effect on the cogs as the light catches them. The movement is set on a pretty antique bronze style adjustable ring. ☣ The movement is no longer working. It is just aesthetically pleasing! The cogs will still turn if you turn the winder though. ☣ The exceptional movement measures a mere 14mm in diameter. Plus the winder. ☣ The ring is adjustable so should fit most people. Folksy :: Buy "Butterfly Vintage Style Adjustable Ring"